"Encounters... each one just long enough for the strangeness of those in front of the camera — and their strangeness to me behind it — to be slightly less than the secrets they once were." 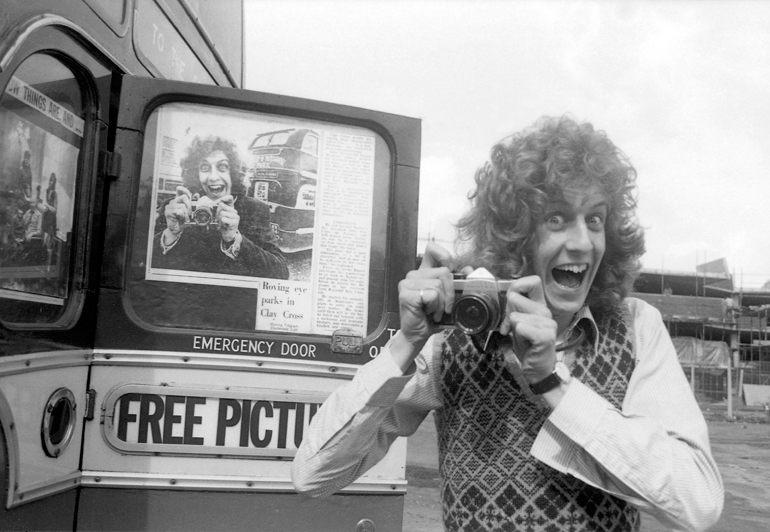 Daniel Meadows in Oxford with the Free Photographic Omnibus, May 1974. Picture: Paddy Summerfield. I have spent a lifetime recording British society, challenging the status quo by working in a collaborative way to capture extraordinary aspects of ordinary life, principally through photography but also with audio recordings and short movies. Born in Gloucestershire, England, in 1952 I studied at Manchester Polytechnic 1970-73. Photography projects from that time include The Shop on Greame Street in Moss Side (1972), also two collaborations with fellow student Martin Parr: Butlin's by the Sea in Yorkshire (1972) and June Street in Salford (1973). In 1973-74 I toured England in the Free Photographic Omnibus running free portrait studios in towns and cities across the country. My account of that journey: Living Like This - Around Britain in the Seventies (Arrow Books) was published in 1975. 1975-77: Photographer-in-Residence, Pendle District, Lancashire. 1978: Clayton Ward, Prestwich Hospital, Manchester (for the Observer Magazine). 1981 and '83: Co. Durham Social Services dept. 1995-2000: National Portraits, Now & Then. 2014-15: High Street Stories (film) commission for Multistory. See the Digital Storytelling pages on this site. I began full-time teaching in January 1981 at Humberside College of Higher Education where I delivered a photography programme for graphic design undergraduates. In 1983 I moved to Wales to teach alongside David Hurn on the Documentary Photography course at Newport's School of Art and Design. In 1994 I moved to Cardiff University to teach photojournalism to postgraduates in the Centre for Journalism Studies. In due course I also began doing digital storytelling with undergraduates. In 2001 I went on secondment to the BBC, as creative director of its digital storytelling project Capture Wales (see the archive of stories at the National Library of Wales — Llyfrgell Genedlaethol Cymru). Returning to Cardiff University in 2006 (to what was now the School of Journalism, Media and Cultural Studies) I delivered classes in photo-appreciation, digital storytelling and participatory media to both undergraduates and postgraduates. I also supervised dissertations across the range from BA to PhD. I retired from academic life in August 2012. In 1995 I began studying the active relationship we all have with our photographs, the ones which represent us and in which our stories are contained. As a result I turned away from being one who "does media to people" and began facilitating others in the making of their own media. My PhD, completed in 2005, tells the story of this journey, explaining why I now work using multimedia, in particular with digital storytelling and other short narrative forms. Meadows, Daniel. 2003. Digital Storytelling: Research-based Practice in New Media Visual Communication 2(2):189-193. Meadows, Daniel, and Kidd, Jenny. 2009. Capture Wales, The BBC Digital Storytelling Project in Hartley, J, and McWilliam, K, (eds.) Story Circle: Digital Storytelling Around the World. Oxford: Wiley-Blackwell. See the Books page on this site. See the Exhibitions page on this site. In the 1990s I taught photojournalism workshops for the Reuters Foundation, The British Council and others in the emerging democracies of Europe; also in India and Bangladesh. Between 2000 and 2008 I travelled widely (mostly in Australia and the USA) lecturing about the new work I had been doing in participatory media. 1978-80 I worked as a researcher and occasional presenter for local television programmes in Manchester. Between 1981 and 1994 I worked as a freelance publicity photographer in the movie and TV business, mainly for film directors Tony Palmer (biopics of Shostakovich, Wagner, Mitsuko Uchida, Yehudi Menuhin), Christine Edzard (Little Dorrit, The Fool) and Ken Russell (The Mystery of Dr. Martinu, Lady Chatterley). * 1988. A Place of Your Own. Three short talks in celebration of the suburban ethos (r/t 12 min each). Behind the Privet Hedge, transmitted 24 April. Nameplates and Lifestyles, transmitted 1 May. Upward Mobility, transmitted 8 May. Produced by David Perry. * 1996. Living Like This. Documentary (r/t 30 min). I revisited some of those I first met while travelling on the Free Photographic Omnibus in 1973-74, transmitted 10 June, repeated 10 August 1997. Produced by Alan Dein and Mark Burman. * 2016. The Free Photographic Omnibus. Podcast documentary (r/t 17 min), from broadcast of 17 June. Produced by Olivia Humphreys. The Hyman Collection. My retrospective exhibition Daniel Meadows, Early Photographic Works, curated by Val Williams and comprising over 130 works including photographs, screen projections and digital films, was acquired by Claire and James Hyman in 2015. The Martin Parr Foundation. My exhibition National Portraits, Now & Then from 2000, 17 pairs of 20x16 inch prints (34 prints in total), was acquired by the MPF in 2017, along with supporting material. 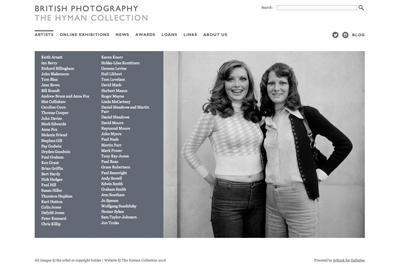 * Arts Council England collection has prints from the Free Photographic Omnibus. * Bodleian Library at the University of Oxford has my entire archive. See the Archive page on this site. * Library of Birmingham has a collection of twelve prints from the Free Photographic Omnibus, a set purchased with an award from The Art Fund in 2009, for its Sir Benjamin Stone legacy collection. * British Library has a Daniel Meadows collection that accompanies the interview Alan Dein recorded with me in October 2015 for the Oral History of British Photography project (see C459/68/1-7). This collection (shelfmark C1720) includes: 40 of my digital stories; the boxed set Eight Stories (Southport: Café Royal Books, 2015, edition of 50 copies); and 122 BBC Capture Wales digital stories (lo-res versions). * Fakenham and District Community Archive has thirty vintage panels (each measuring 15 x 12 inches) of prints with accompanying text mounted on card. This exhibition, a Free Photographic Omnibus commission was undertaken in August 1974 and first exhibited in the town in May 1975. * Heritage Trust for the North West, at Pendle Heritage Centre, Lancashire, has a complete set of 35mm negatives, contact sheets and 10x8 inch prints for more than 600 buildings (and parts of buildings) photographed for European Architectural Heritage Year (1975), during my Borough of Pendle residency 1975-77. * Side Gallery, Newcastle-upon-Tyne, has thirty-three vintage panels (each measuring 15 x 12 inches) of prints with accompanying text mounted on card, an exhibition I created for Northern Arts of work done in the autumn of 1974 from the Free Photographic Omnibus. Northern Arts was one of the six Regional Arts Associations (RAA) who sponsored the Bus project. * Victoria & Albert Museum, London: 2 pictures from group exhibition The Other Britain, 1982, commemorating the 20th anniversary of New Society magazine. 2002: BAFTA Cymru for BBC Capture Wales. 2006: Cardiff University Innovation Network Prize for BBC Capture Wales. 2008: Honorary Fellowship of the Royal Photographic Society. Interview with Daniel Meadows made during 2014-15 High Street Stories commission for Multistory in Sandwell, West Midlands. See also: BBC Midlands Today coverage. r/t: 5 min, 26 sec. Once published, photo- graphs take on lives of their own that we cannot share. But here is a one which did come back... as chamber music. Thank you David Howard. Thank you Brina Jež Brezavšček.